Do you know the relative profitability of your farm’s enterprises? Many Australian farmers are involved in ‘multiple enterprise’ farming systems, which means the profits from each enterprise should be known. It is important to understand gross margin budgets and their role in farm financial analysis. Understand gross margin budgets for cropping. Uses and benefits of gross margin budgets. Limitations of gross margin budgets. Want to link to this publication? Use www.grdc.com.au/GRDC-FS-FFT-CropGrossMarginBudget to ensure your link remains current and up-to-date! 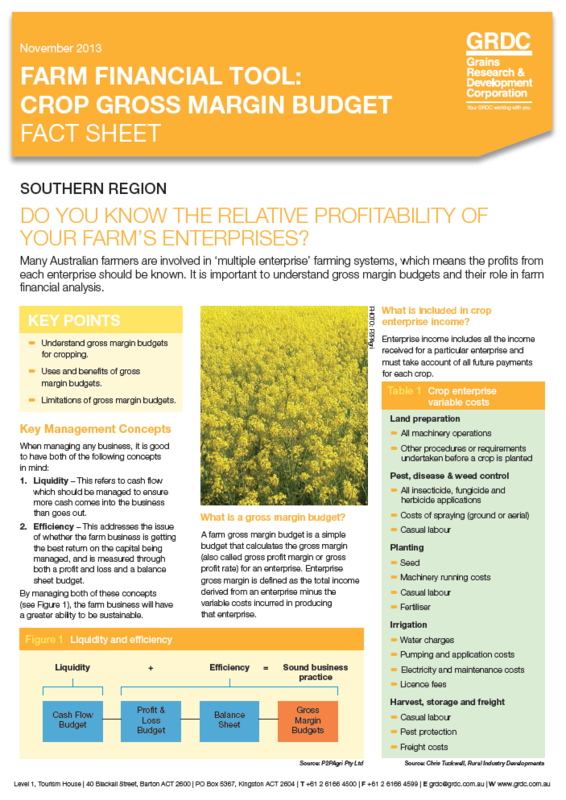 1.24 mb Farm Financial Tool: Crop Gross Margin Budget Fact Sheet Do you know the relative profitability of your farm’s enterprises? Many Australian farmers are involved in ‘multiple enterprise’ farming systems, which means the profits from each enterprise should be known. It is important to understand gross margin budgets and their role in farm financial analysis.